The choice of the right sisal fabric ring, with the right combination of sisal fabric and possibly cotton fabric, the right number of quilting circles and the right dimensions, has to be determined for the respective customer-specific application. Solid sisal fabric rings consist of 8-ply sisal fabric in a 45º oblique cut, i.e. the warp and weft threads are at an angle of 45º to the outer diameter. 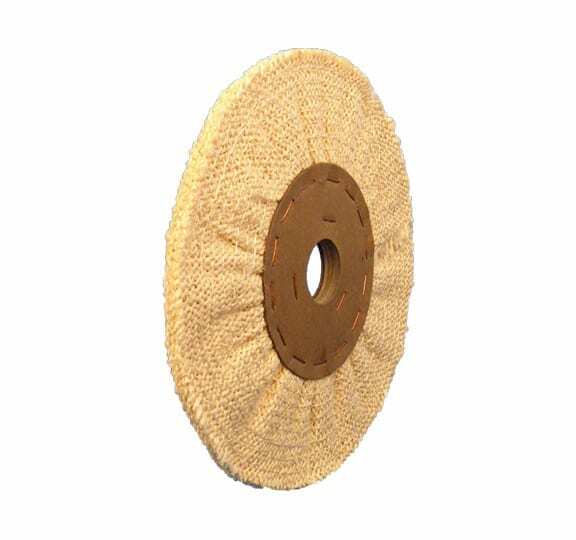 This prevents the threads from tearing out and the associated fraying of the sisal fabric rings, ensures clean processing and significantly increases the tool life. The standard stitching distance for sisal rings is 10 mm. Other types of quilting can, however, be produced on request at any time. The core can be supplied with or without a cardboard core, but also with a steel ring inlay. In order to obtain optimum results, it is recommended to use impregnations for the sisal tissue rings. Impregnations improve the service life and the adhesion of the polishing paste. Basically, it can be said that very hard impregnations are also used when processing workpieces made of very hard materials. For workpieces made of very soft materials, however, very soft impregnations are also used. The sisal fabric rings are used for pre-polishing, fine grinding, brushing and matting of flat and slightly rounded workpieces. These are efficient “pre-polishing rings” for all workpieces, such as flat parts, cooking pots, aluminium parts, etc.. The sisal fabric rings have a good attack effect with low noise development during the machining process.